Extreme RC World – No Remote Location! H&N Perry would like to welcome Extreme RC World who just opened last week at their new store – 12, 4 Guava Way, Halls Head! If you’re looking for something fun, Extreme RC World are a brand new store store to Mandurah that specialise in remote control drones, boats, planes, helicopters, drift cars and truggies. They also supply spares, kits and can assist with repairs and advice. They are a locally owned family business who guarantee their customer service. As an opening special, Extreme RC World are offering their customers 20% OFF EVERYTHING! (28th May – 4th June). Keep an eye out for their ‘shopadocket’ specials. The new store is located at the gateway to the new Halls Head Shopping Centre on Guava Way. This high profile position provides a steady flow of customers using other nearby businesses such as The Peel Alehouse, Jones & Co Hair & Beauty, Halls Head Fish and Chips, Perfect Pizza, Red Rooster, Peel Flower House, Khatoon Supermarket and Champagne Travel. The air-conditioned shop is spacious with plenty of room to display their wide range of stock and plenty of parking for customers nearby. It’s great to see new businesses start in Mandurah and Extreme RC World will be a real asset to the Peel community. We wish Extreme RC World every success in their new venture. The entire complex of retail outlets along Guava Way is managed by H&N Perry. We have been Mandurah’s leading property managers for over 65 years. Along with retail property management, we also manage industrial, commercial, warehouses, showrooms and office space. If your commercial property is sitting vacant, call H&N Perry on 9535 1822. Over the last 6 months, the Peel community has been forced to grapple with the senseless tragedy of several youth suicides within our community. These deaths have had an enormous impact not only on the families and friends of those involved, but also on the wider community as a whole. Unfortunately, suicide is the biggest cause of death in young people in Australia. Youth who come from regional areas tend to be more at risk, with an increase in mental health problems stemming from a variety of issues such as higher unemployment, housing stress and social isolation. The sharp increase in recent youth suicides in the Peel Region has raised awareness of mental health issues, and also the lack of resources available to our young people. Both state and federal governments have been heavily criticized for their lack of real funding to such an important social issue. Mandurah’s local business community has rallied behind this important cause showing great generosity. Madora Bay Partnership has made an honourable donation of $25,000 to PYMS (Peel Medical Youth Services) and a further $25,000 donation to Passages Resource Centre. “As local corporate citizens, Madora Bay Partnership is keen to assist in overcoming this scourge on the young community of Peel,” said Madora Bay Partnership Director, John Perry. PYMS require funding for their 3-Tier Youth Mental Health Program which is ready to be rolled out across schools. Passages Resource Centre assists homeless youth in finding safe accommodation. Other community support has come in the form of charity raising events such as Choirfest which involves more than 300 children holding a concert to raise money towards mental health programs. Bendigo Bank donated $2,500 towards this event and the City of Mandurah donated $2,000. There will also be a PYMS Charity Ball held on the 18th June at Bendigo Bank Stadium with all funds raised going to the PYMS 3-Tier Youth Mental Health Program. The release of REIWA’s sale statistics may not seem like good news for sellers, however if you are buying and selling in the same market you will hold the value of your property dollar. A fall in population growth for the Peel Region has created a generous supply of properties for sale which is giving buyers a lot of extra choice. These conditions are favourable to both first home buyers and also growing families looking to trade up. Traditionally the Mandurah / Murray Region experiences a slight decline in sales over the winter months before rising again over summer. Wise buyers will use these statistics to make their purchase over winter. We are seeing a steady flow of buyers taking advantage of those properties that are priced realistically. If you’re interested in selling and would a realistic appraisal of your home’s value in today’s market, call H&N Perry on 9535 1822. LEASED, LEASED, LEASED… Is Yours? The H&N Perry Commercial Department has been so busy leasing properties over the last few weeks that we are getting low on stock! Through August and September our experienced Property Managers have secured leases for 12 new businesses in the Peel Region. The type of commercial properties that are being leased have been widely varied from office space and retail shops, through to large showrooms and industrial buildings. Floor spaces from as little as 75sqm right through to a massive 536sqm have been in high demand. This is great news for Mandurah as business throughout the region continues to grow. 2, 14 Peelwood Parade, Halls Head – Leased to Interchange Inc.
home a swag of awards. The first award to be presented was the ‘Home Based Business Award’ which was sponsored by Madora Bay Estate. Congratulations to Confident Cashflows who took home the major prize for this category. H&N Perry were the proud sponsors of the ‘Business With 5 to 10 Employees’ category which was won by a very deserving Forest Edge Recreation Camp. The ‘Franchise Business Award’ was presented by John Perry on behalf of Florida Beach Estate and the winner was Battery World Mandurah. Some of the other winners for the evening were… Drakesbrook Antiques and Collectables, 4Life Physiotherapy, The Sebel Mandurah and Mandurah Cruises and Gift Shop. 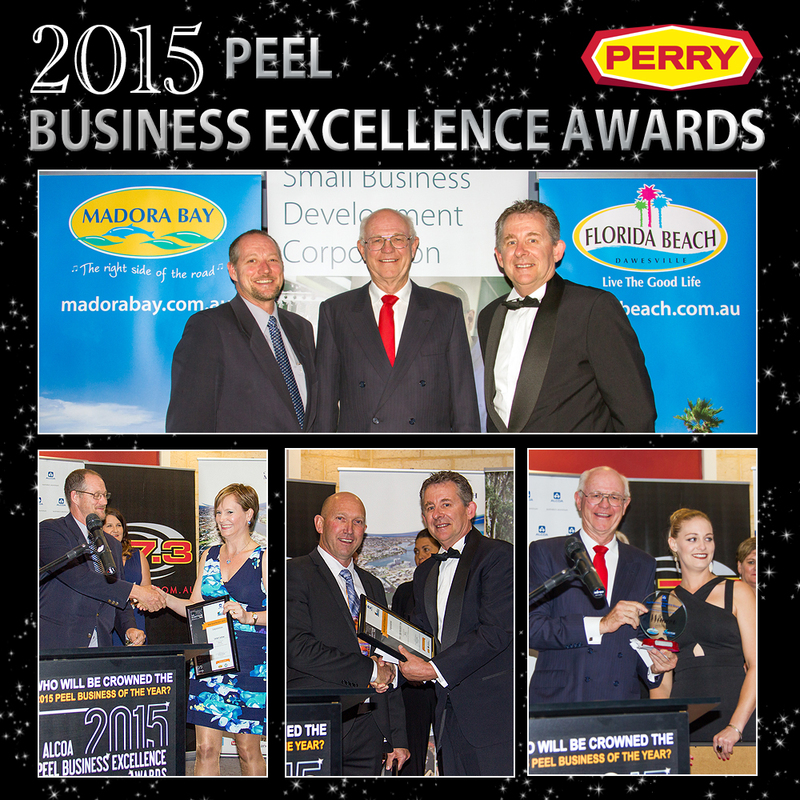 Congratulations to all of these Peel businesses as well as the runners up and finalists for each category. Mandurah is extremely fortunate to have such a supportive and inclusive business environment. H&N Perry would like to thank and congratulate the Peel Chamber of Commerce on the success of this year’s Business Excellence Awards. Pinjarra is a town within the Peel Region situated to the east of Mandurah. Over the years, Pinjarra’s population has boomed from a small country holding of 400 people in 1898 to over 4,000 people today. One of the major reasons for Pinjarra’s population increase was the establishment of Alcoa Alumina Refinery in 1974 which brought new people to the area for employment opportunities. Pinjarra is also the site of the world’s largest bauxite mine. 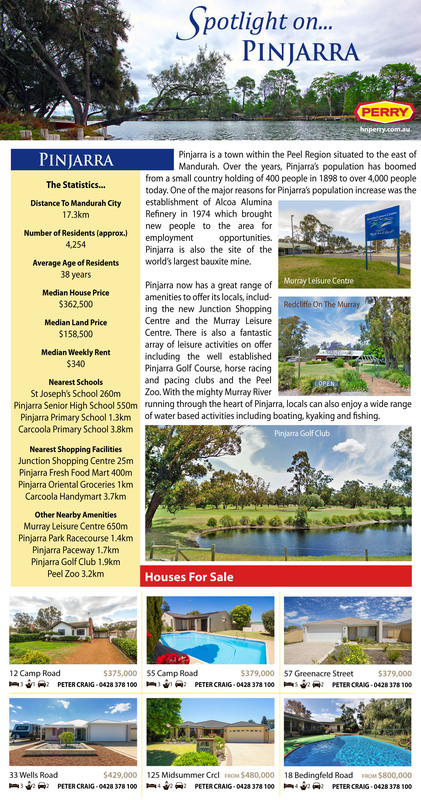 Pinjarra now has a great range of amenities to offer its locals, including the new Junction Shopping Centre and the Murray Leisure Centre. There is also a fantastic array of leisure activities on offer including the well established Pinjarra Golf Course, horse racing and pacing clubs and the Peel Zoo. With the mighty Murray River running through the heart of Pinjarra, locals can also enjoy a wide range of water based activities including boating, kyaking and fishing. H&N Perry have houses and commercial buildings for sale in Pinjarra. We also manage commercial and residential properties in Pinjarra. If you’re looking for a house to buy or an experienced property manager to manage your investment property, call H&N Perry on 9535 1822. Welcome to H&N Perry’s ‘Suburb Spotlight’ newsletter. Each week we will shine the spotlight on different suburbs in Mandurah and the surrounding Peel Region. Take a look at the great benefits and amenities that are available in each suburb, along with a comprehensive guide to property sales and statistics. Located directly south of Mandurah, Dudley Park is encompassed by the Peel Estuary, Boundary Road and stretches across Old Coast Road, south of Coodanup Drive and west of Wanjeep Street. The suburb includes Waterside Canals, Mariners Cove and Tuckey Cove. Residents of Dudley Park are extremely lucky to be located so close to all of the amenities that Mandurah has to offer such as the Mandurah Foreshore cafe strip, Mandurah Aquatic and Recreation Centre and Mandurah Library – not to mention the beautiful Peel Estuary waterways.